The Original Tropic Isle Brand: Because Credibility Matters! We often mention to our customers that they can mix their Tropic Isle Living Jamaican Black Castor Oil (JBCO) with their favorite all-natural hair conditioner or shampoo. We knew it was extra work for the customer, but the benefits would make up for the extra effort. The challenge, however, was for our customers to find a truly all-natural, chemical-free conditioner and shampoo. Our friends at Tropic Isle made the challenge their own, and they even took it one step further by creating Tropic Isle Living’s All-Natural Jamaican Black Castor Oil Shampoo with Shea Butter. We are extremely proud of this product because it thoroughly cleanses, nourishes and moisturizes your hair, all at the same time. Tropic Isle Living’s Jamaican Black Castor Oil Shampoo contains no sulphates, parabens and other potentially harmful chemicals. It’s made of Jamaican Black Castor Oil and other organic and natural ingredients such as, aloe vera, Jamaican pimento oil and shea butter. All these ingredients, together, give our shampoo the moisturizing and stimulating benefits dried out hair truly needs. Tropic Isle Living Jamaican Black Castor Oil Shampoo with Shea Butter encourages strong healthy hair and scalp. It relaxes the hair follicles, leaving them silky smooth, thus helping to eliminate hair breakage, dandruff and dry, itchy scalp. This extraordinary shampoo also stimulates hair growth and adds a natural sheen and manageability to hair. The ingredients gently infuse your hair follicles and skin cells with natural minerals, herbal extracts, and oils. 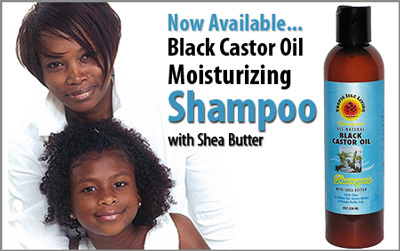 The addition of Shea Butter enhances the moisturizing capability of our Jamaican Black Castor Oil Shampoo. Look At What's In Tropic Isle's Jamaican Black Castor Oil Shampoo! Wow! The Original Tropic Isle Brand: The Name You Trust! The Original "All Purpose Healing Oil"
Castor Oil is an ancient remedy that has been used throughout history for a variety of ailments. Over 500 years ago, slaves brought the seeds from Africa to Jamaica, where the extracted oil is still made the traditional way by many older folks. Tropic Isle is proud to continue that tradition with our Tropic Isle Jamaican Black Castor Oil. Many manufacturers use refined Castor Oil from South America and Asia and then add coloring to darken the oil and label the finished product as "Black Castor Oil." Others add a tip of Jamaican Black Castor Oil (JBCO) to the mixture and call it "Jamaican Black Castor Oil." Raw, unrefined Jamaican Black Castor Oil is a rare commodity. It is only a hand full of elderly Jamaicans who still engage in the art of producing raw, unrefined Jamaican Black Castor Oil. That is why it is not available on a large scale. Our Tropic Isle brand is real, 100%, made-in-Jamaica, Jamaican Black Castor Oil. You can tell by the smell. Tropic Isle Jamaican Black Castor Oil (JBCO) is know to cleanse toxins from the scalp, nourish and thicken the hair, stimulate hair growth, moisturize dry brittle hair, repair split ends, and give hair body and bounce. Older Jamaicans will tell you that Jamaican Black Castor Oil (JBCO) can be massaged into the skin to help eliminate the wastes and toxins that manifest as eczema, pamplona, liver spots, moles, warts, pimples, rashes and more. Use Tropic Isle Jamaican Black Castor Oil for dry skin and stretch marks. Massage Tropic Isle Jamaican Black Castor Oil (JBCO) mornings and nights into corns and calluses to soften them and remove the soreness. Massage joints and muscles with Tropic Isle Jamaican Black Castor Oil (JBCO) to cleanse, sooth, and improve circulation to areas affected by arthritis, rheumatism, joint stiffness, and muscular aches and pain. Jamaican Black Castor Oil (JBCO) is traditionally used by women to help expel afterbirth wastes, thus helping to reduce stomach size after pregnancy. Older folks traditionally recommended the use of castor oil to induce labor during pregnancy. However, because large doses of castor oil can be lethal, we do not recommend using it to induce labor or expelling afterbirth waste without consulting a competent medical practitioner. Use our Jamaican Black Castor Oil (JBCO) as a breast massage oil. It is believed that when used for breast massage, castoroil helps prevent lumps and cysts. --Apply JBCO to hair like hair grease for moisturizing purposes. --Massage JBCO into scalp for healthy hair growth and scalp problems. --If you have dry, perm and colored hair, add 3 tablespoon Jamaican Black Castor Oil to your favorite conditioner. it adds extra moisture to your hair and seals it in. --Use for hot oil treatments: warm three tablespoons Jamaican Black Castor Oil and massage into hair then put on heating cap for half hour. Or massage 3 table spoons of Jamaican Black Castor Oil into hair, put on heating cap then go under dryer for 10 minutes. --Massage JBCO into skin to moisturize dry skin and to help prevent skin problems such as eczema, psoriasis, itchy skin, rash etc. Warm or simply massage JBCO into areas where you are experiencing discomfort. --Use JBCO as any regular hair grease. --Apply JBCO directly to scalp to add nutrition to hair. --Massage JBCO directly into scalp to prevent dandruff, itchy scalp, and dry scalp. --Put JBCO in hair immediately after drying. It immediately replaces moisture loss from heat. --JBCO is Excellent for dry, chapped hands and feet. Step 1. Wash hair with all natural shampoo. Step 2. Towel dry excess water from hair.